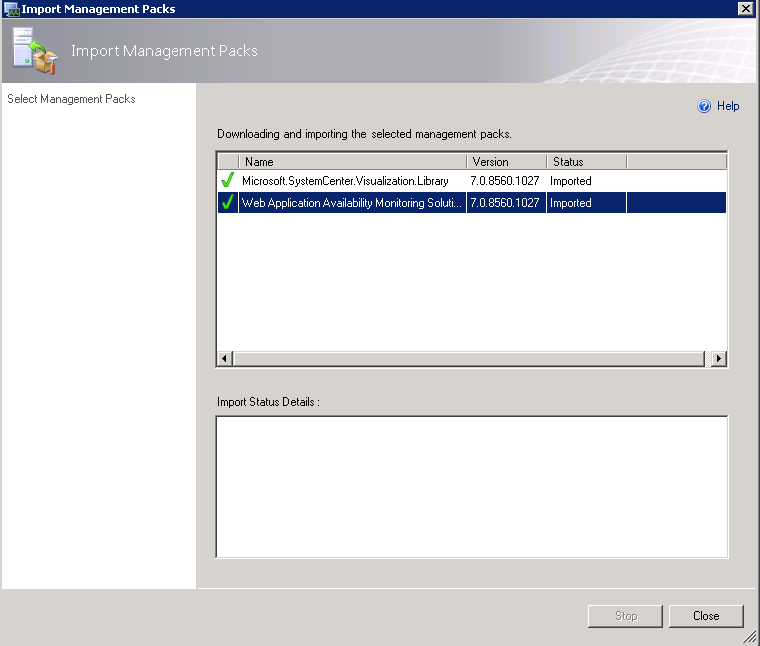 Here, we go again with another round of Cumulative Updates to apply to your System Center 2012 deployments. 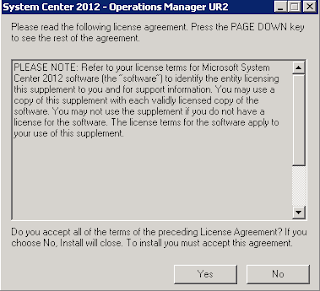 Yesterday, Microsoft announced the release of Cumulative Update 2 (UR2) for the System Center 2012 suite and you can find a description of it here. Unlike Cumulative Update 1, this hotfix just provides resolution to five issues, three of which are on the Cross Platform/Unix/Linux side of the product. 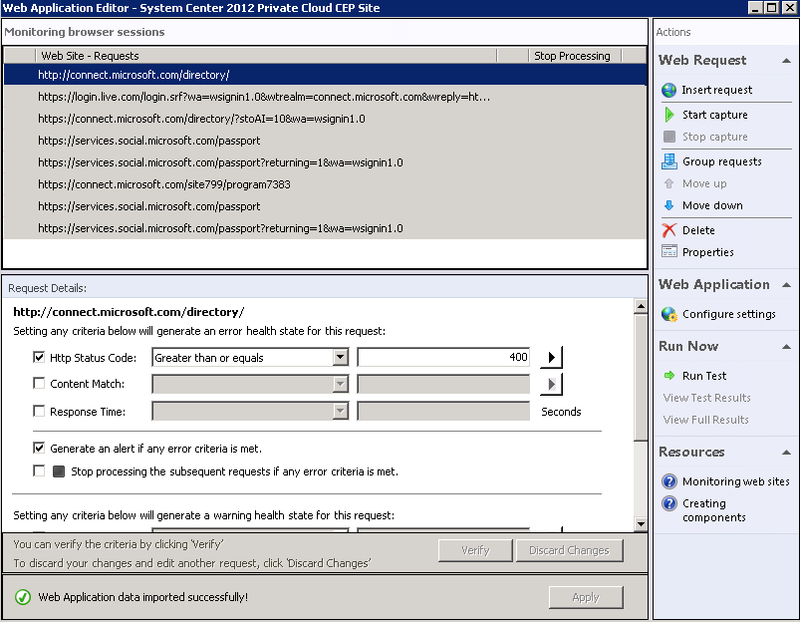 This post will walkthrough the steps required to deploy the Update Rollup 2 to your SCOM / OpsMgr 2012 deployment. 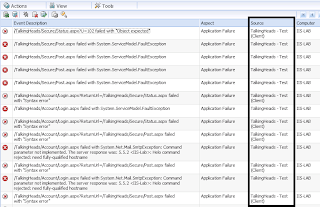 This post is effectively an update of my previous post on deploying Update Rollup 1 (CU1) to SCOM / OpsMgr 2012. 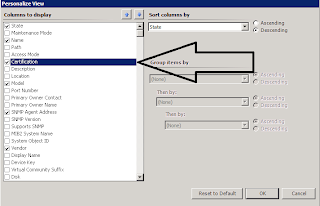 As before, the process to deploy the update is quite simple and this time there is no need to run any SQL queries against the SCOM databases as part of the update - as was the case with the SCOM 2007 R2 CU's. 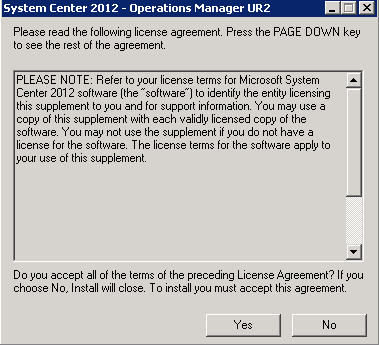 Some of the information below is taken directly from KB2706783 on the Microsoft Support website. 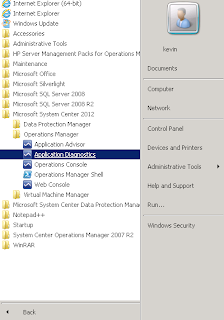 Updates do not appear in the Add or Remove Programs item in Control Panel after you install Update Rollup 2. The version number of the console does not change after you install Update Rollup 2. After Update Rollup 2 is installed, the version number of the console remains 7.0.8560.0. To resolve this issue, close and then restart Internet Explorer. 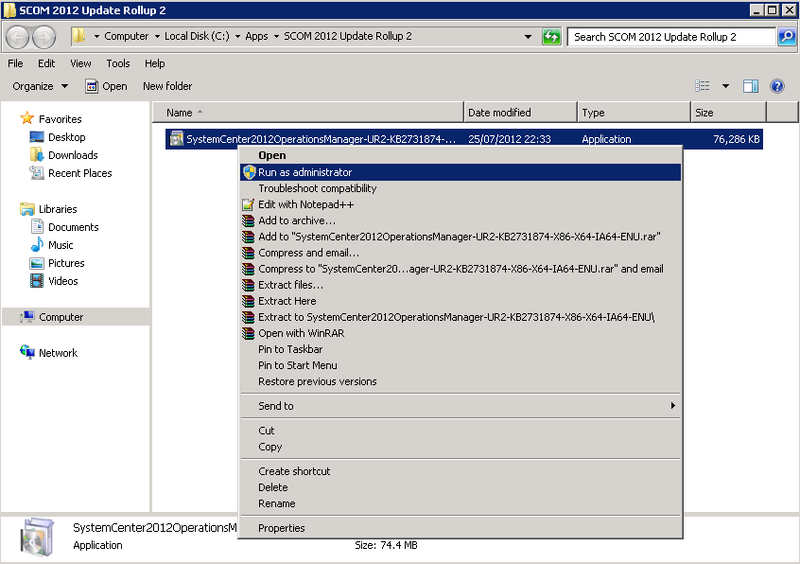 Operations Manager Update Rollup 2 will at first be available only in English and cannot be applied to non-English versions of System Center 2012. Non-English versions of Update Rollup 2 will be available later in 2012. Note: On servers that have User Account Control (UAC) enabled, be sure to run these updates from an elevated command prompt as you will most likely receive 'Access Denied' errors when running direct from the GUI. 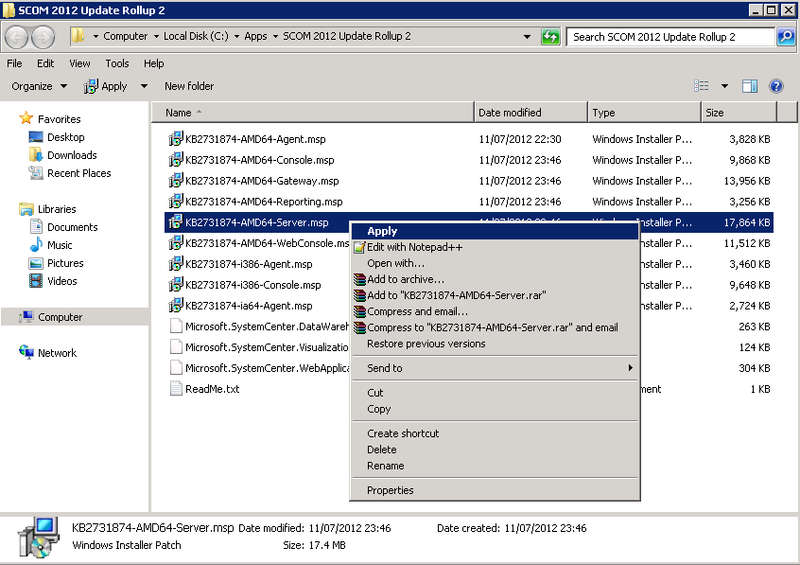 The server I'm installing this to is a single SCOM (OpsMgr) 2012 Management Server with the Console and Web Console roles deployed so in this instance, I have to install three packages - KB2731874-AMD64-Server, KB2731874-AMD64-Console, KB2731874-AMD64-WebConsole. 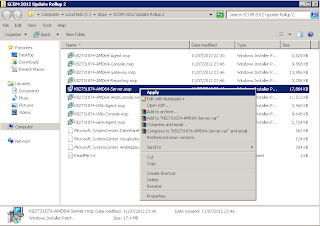 In my environment, I also need to deploy the KB2731874-AMD64-Reporting package to my SQL Reporting Services (SSRS) server and the KB2731874-AMD64-Gateway to my SCOM (OpsMgr) 2012 Gateway server. 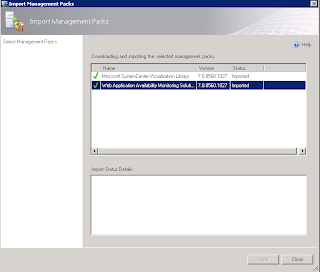 Once you are happy that your first SCOM 2012 Management Server has been updated, then you can then move onto installing the new management packs that come with the CU2 hotfix. 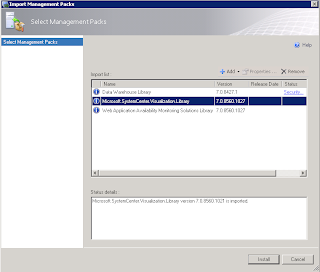 If you have previously upgraded to Cumulative Update 1 (UR1), then you will notice that the version of the Data Warehouse Library management pack is the same version number for CU2 and this will not be imported. If you haven't upgraded to CU1, then the import will upgrade all three new management packs at this point. Note:The management pack bundle files for each UNIX and Linux operating system version contain the management pack and agent files. You may have to wait several minutes after you import the management pack bundle before the agent files are available for agent upgrades. 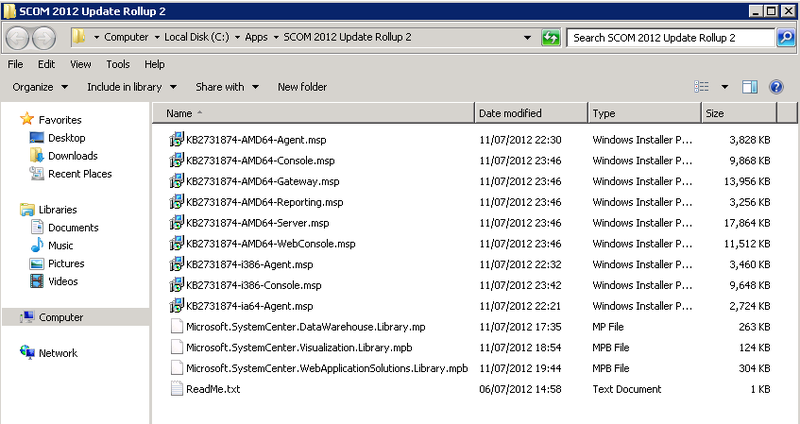 That completes the deployment of SCOM 2012 Cumulative Update Rollup 2 (CU2) into your environment. I don't know about you, but as a System Center consultant, I really appreciate when new features give us new consoles to work with as it keeps things different during deployments and when presenting. With System Center 2012 Operations Manager (SCOM / OpsMgr 2012), we have the new Application Performance Monitoring (APM) feature that allows us to deep-dive into the code of our .NET applications from a server and client-side perspective. 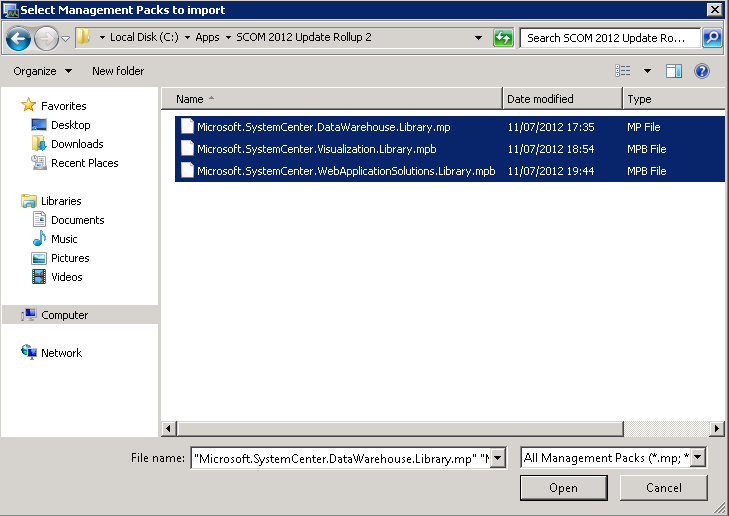 APM comes with two new web consoles that are installed together during the deployment of the SCOM 2012 Web Console role. These are the Application Diagnostics and Application Advisor consoles and the aim of this short blog series is to give people a much better understanding of what they can do and how you can use them when managing your applications from an APM perspective. 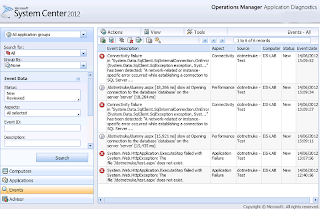 SCOM 2012 - APM CSM vs. GSM and Web Application Monitoring....Confused? 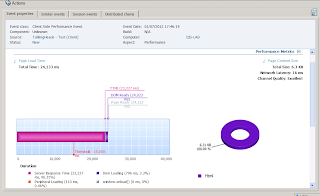 Known as SE Viewer in AVIcode 5.7, the Application Diagnostics console is used to organize and link events across your monitored .NET applications to help you quickly ascertain the root cause of a problem. 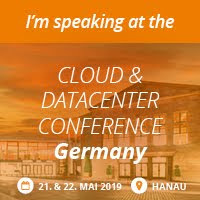 It allows you to analyze the individual performance and reliability events that are being raised within your .NET application along with the transaction chains related to those events to help you to understand how these types of issues are impacting your business applications. This console will be of definite interest to the members of the development team as it returns a whole raft of additional information that isn't available within the standard SCOM 2012 console as shown in the screenshot below. 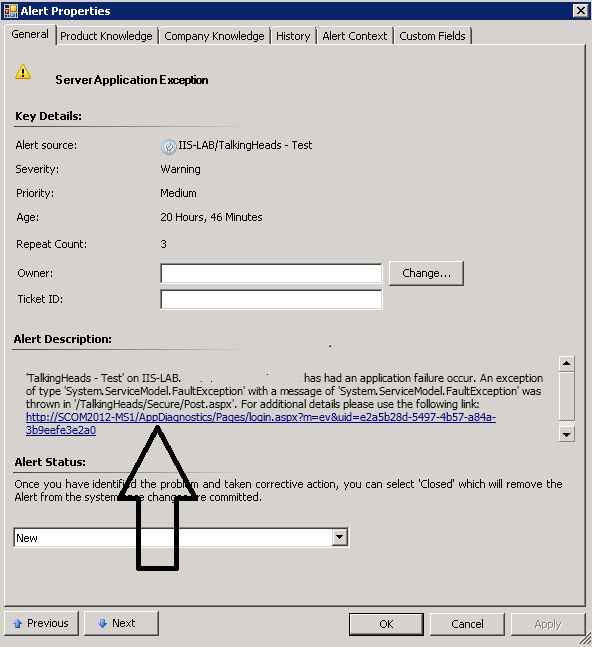 Lastly and probably the most common way that you'll launch this console is by clicking on the scoped URL link in the Alert Description or Alert Context pane of an APM alert that is located in the Monitoring > Application Monitoring > .NET Monitoring > Active Alerts view of the Operations Manager console. 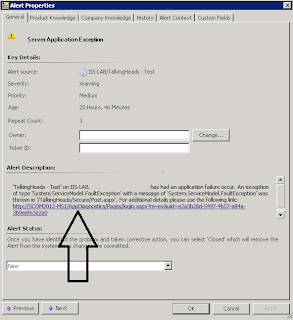 The screenshot below shows an example of the scoped URL presented from within the Alert Description tab of one of these alerts. When you've launched the console, there are four navigation buttons that you can click on. Each one represents a different area that you can browse to that deliver the type of application diagnostics required to quickly find the root cause of a problem. The Computers button gives you information on the computers that are hosting your .NET applications. From here, you can create and select new Application Groups that allow you to focus in on events orginating from the same applications. 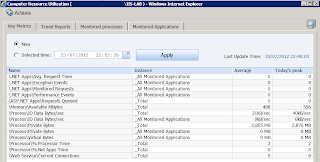 The Configuration view lists the computers that your monitored .NET applications are running on and delivers basic information about the number of CPU cores they're running and their monitored processes too. 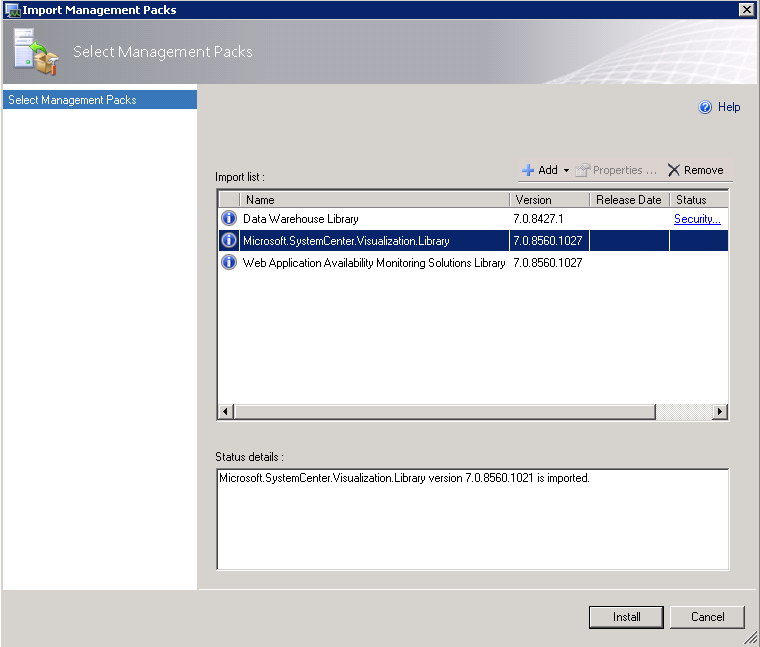 The Resource Utilization view also lists the computers that are running your .NET applications but returns additional information about resources such as % CPU Time, Memory, I/O and Application Load. Clicking on the Applications button will give you a view very similar to the view you would see when clicking the Computers button as described above. 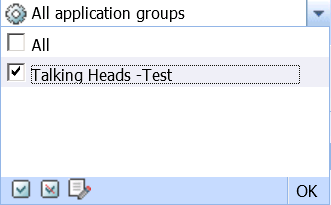 However, this view displays information on the actual .NET applications as opposed to the computers that host them. Key Metrics - Display a performance graph with data from the application on its load, monitored requests and average request time. Computers - An overview of the computers being monitored along with the number of events, sessions and requests. Topology - Overview of the basic topology of the application and gives a breakdown of where the events are happening based on chains across the server-side and client-side components. 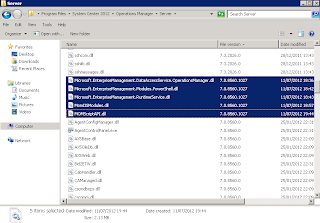 In this view and from the central pane, we can see two different Sources for .NET application generated events (client-side and server-side) and these are easily identified in the Source column. When you click on an event here, the Source of the event will determine the different tab options available to you. Lastly, the only purpose of this button is to act as a shortcut to launch the Application Advisor console directly from inside the Application Diagnostics console. Part 2 in this series will cover Application Advisor in more detail. 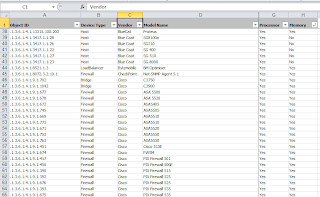 I had a requirement today to export a list of all the SCOM / OpsMgr 2012 agent managed devices to a CSV file and thought I'd do up a quick post in case anyone else finds it useful. 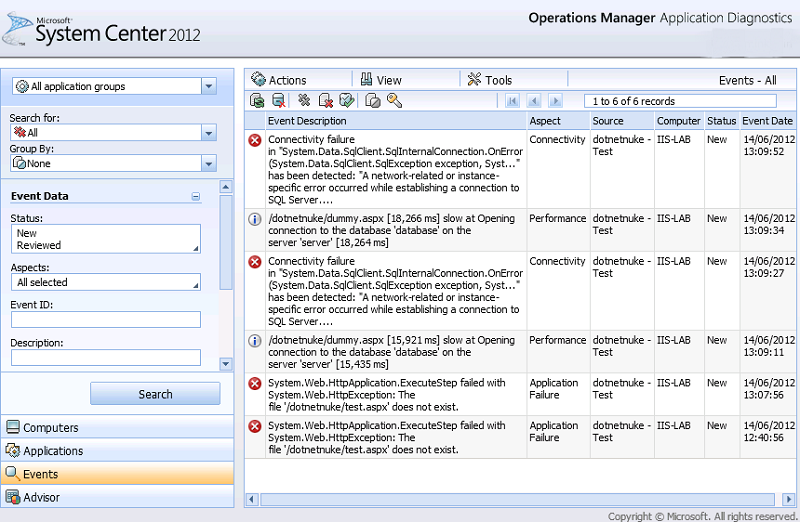 This also might come in handy as an add-in for your System Center 2012 Orchestrator runbooks too. Just copy and paste the relevant line of script from above into PowerShell on one of your SCOM management servers to create a file on the C:\ drive called 'scomagentdevices.csv'. This CSV file contains all of the information available on the agent such as -Patchlist, PrimaryManagementServerName, ManagementGroup, ID, LastModified, Name, DisplayName, HostComputer - etc. Hopefully someone else finds this helpful too! 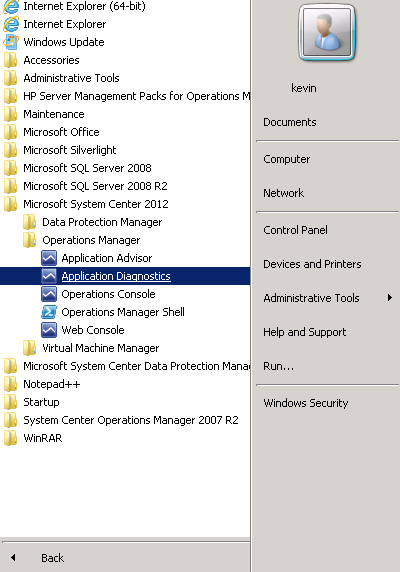 This post is as much a place-holder for me as it is for anyone else and something that is of utmost importance in System Center 2012 Operations Manager (SCOM / OpsMgr 2012) deployments. 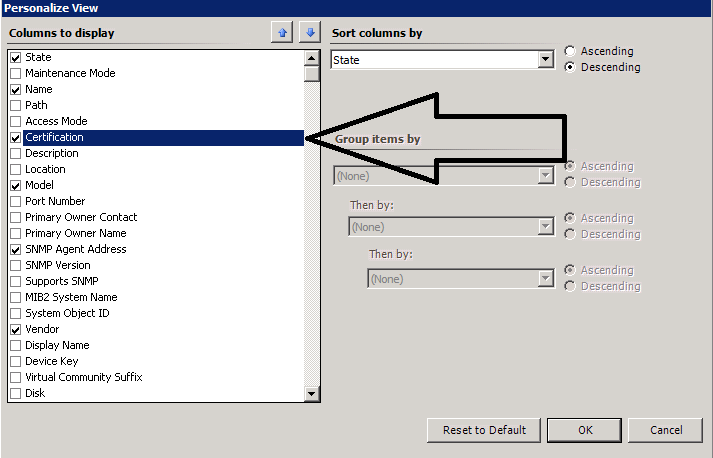 Pete Zerger and Matthew Long of Infront Consulting have put together a nice and simple (but very effective) script that enables maintenance mode of groups in SCOM 2012. This script has been designed to make scheduling it as a Windows Scheduled Task work seamlessly. Every time a new product is released, we get bombarded with loads of new acronyms to try get our heads around. Once we figure out what these acronyms mean, then we have to understand what new features they actually refer to and how (or if) we can use them in our deployments. System Center 2012 Operations Manager (SCOM /OpsMgr 2012) is no different. With APM, we get two types of monitoring to work with from an application level. Server-side Monitoring and Client-Side Monitoring - also known as CSM. 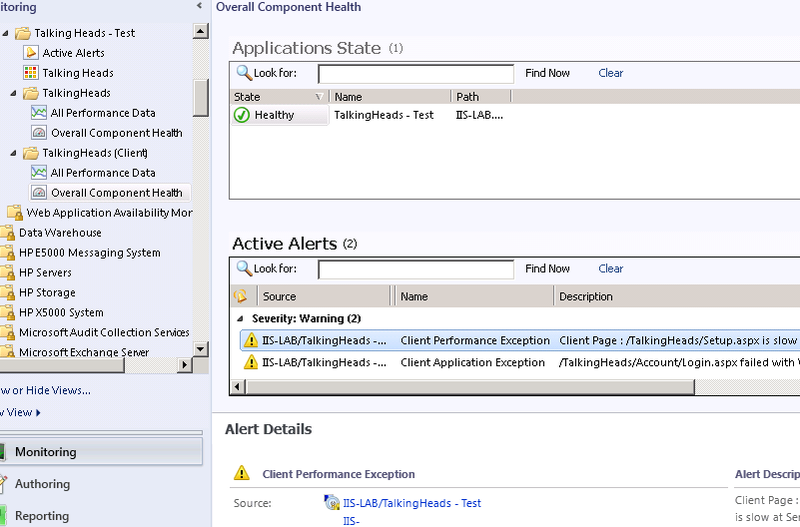 CSM works with a specified application from the 'inside' and raises alerts based on the actual code. It also has a pre-requisite that APM Server-Side Monitoring is configured first and that the IIS websites hosting the web application must also be discovered and monitored too. From a performance perspective, CSM can tell us when there is a performance related problem with our application and then deep-dive into it 'to tell us why' there’s a problem. CSM returns real data based on the users experience of the web application. 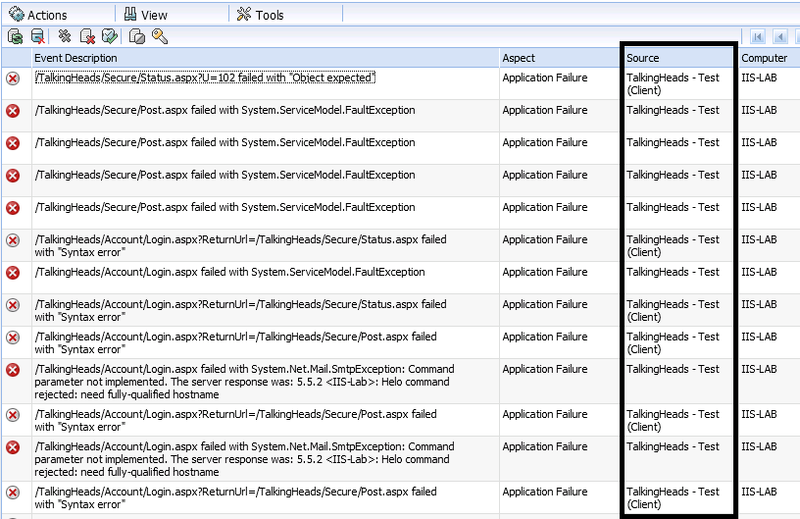 Web Application Monitoring is another feature that comes out of the box with SCOM 2012. It works with any given web application's URL to probe the application from the 'outside' using designated watcher nodes that have the SCOM agent installed on them.This type of monitoring also provides the functionality to record web browser sessions and the screenshot below shows an example of this in action. To use Web Application Monitoring, there's no requirement to have APM or IIS monitoring in place first. Although this type of monitoring can certainly tell us that there's a performance issue when accessing a particular website, it 'cannot tell us why' there is a problem. Web Application Monitoring simulates the users experience of the web application. Recently, Microsoft announced the 2nd Customer Technology Preview (CTP2) release of Service Pack 1 for System Center 2012 which includes a new feature called Global Service Monitor or GSM. GSM is a cloud based service running on Microsoft's Azure platform that extends SCOM 2012 capabilities by providing a kind of "agents in the cloud" extension to your on-premise monitoring and delivering an 'outside-in' perspective of your applications. It allows you to schedule automatic synthetic transactions from locations around the world providing the capability to monitor the availability, performance and reliability of your externally facing web applications as shown in the screenshot below. Essentially, GSM also simulates the users experience of the web application. Microsoft's Åke Pettersson has put together a very informative blog post on configuring GSM that's well worth taking a look at here. From the information above, we can see that on the surface of it, you would be forgiven for thinking that they are all simply application monitoring features that deliver the same 'end goal'. 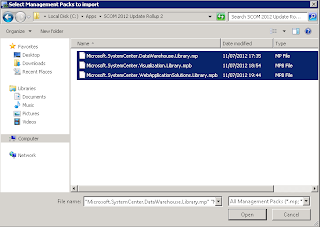 It's understandable that some people might then presume that you don't need to deploy or use all of these features inside your SCOM 2012 environment and that one feature or the other would suffice. When comparing these different application monitoring features however, it’s important to be aware that it most definitely isn’t a case of choosing one over the other. On the contrary, APM CSM, GSM and Web Application Monitoring all complement each other and, although they all monitor the users experience of the web application, they use very different methods to do it. The best way to ensure that you get the full '360 Degree' monitoring view of your web applications is to first use APM CSM to deliver the rich in-depth code analysis that you need. Then to have it working in conjuction with GSM and Web Application Monitoring which have responsibility for probing the application websites for availability from locations all around the world and ensuring that web transactions are actually happening in the first place. 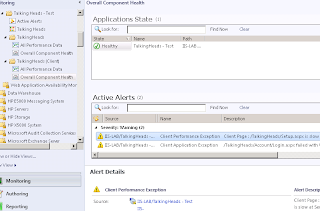 Don't forget of course, that if you want to be able to use APM CSM to manage alerts and exceptions that are generated from within your applications, you need to have users hitting your website and using the application in the first place. If nobody can access it by URL or if the performance of it is poor from certain locations around the world, then APM CSM alone won't be able to help you! All things considered, it's always recommended to configure your application monitoring using a combination of all the above features to get the transparency that you need to be pro-active as opposed to re-active when it comes to resolving availability and performance issues. An added bonus will also be a happy joining of your Dev and Ops teams when it comes to application troubleshooting! 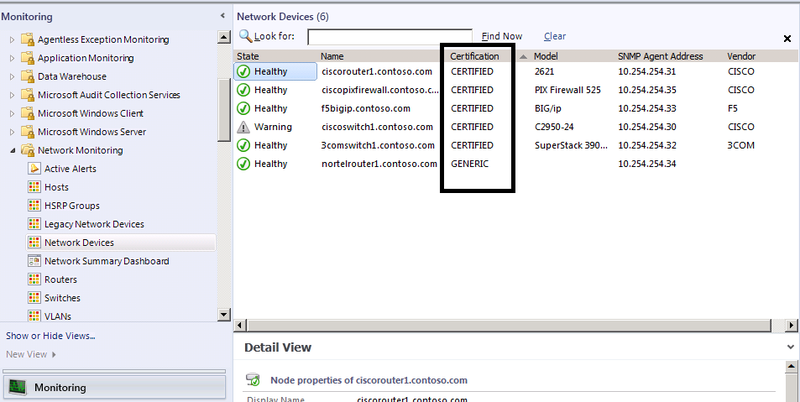 SCOM 2012 Network Monitoring - Dude, Where's My Network Device Components? 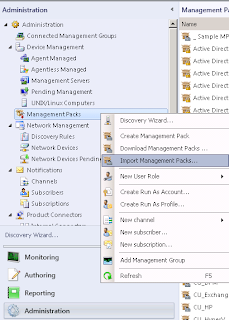 With System Center 2012 Operations Manager (SCOM / OpsMgr 2012), we now have some excellent new Network Monitoring functionality that I've previously blogged about how to configure and described what type of discoveries where available. Sometimes though, when administrators or consultants deploy the SCOM 2012 Network Monitoring feature, they find that SCOM doesn't retrieve the information and discoveries on their network devices that they had initally hoped for or read about. Instead they find that all that get's discovered is the network interface that the device was initally discovered on and it has simply performed an availability poll to return a health status back to the console- effectively giving them just a simple "Up or Down" scenario which is pretty much the same type of network monitoring that was made available out of the box with SCOM 2007 R2. If this scenario seems familiar to you and you are contemplating scrapping the built-in network monitoring features of SCOM 2012 and instead downloading and importing the old and reliable xSNMP Extensions MP that delivered so much in SCOM 2007 R2, then DON'T! 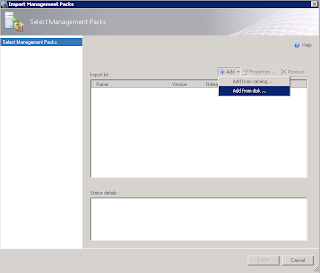 First up, the xSNMP Extensions MP breaks cookdown in SCOM 2012 and won't work. All it will do is impact performance in your newly deployed SCOM 2012 environment and cause you endless headache. Secondly, there is a valid reason as to why you are only seeing basic availability monitoring with your network devices. 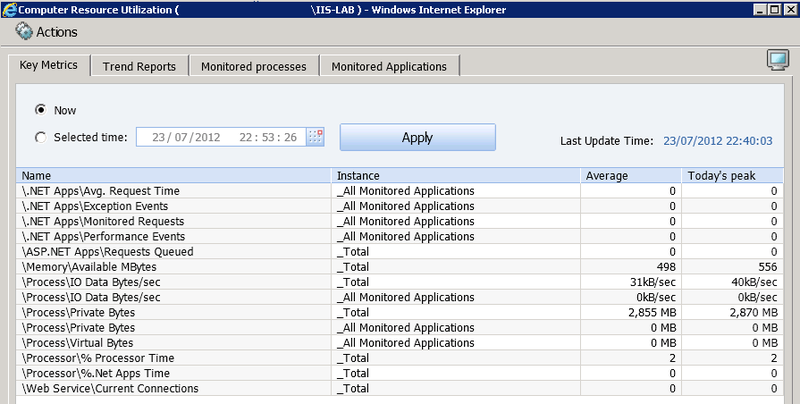 SCOM 2012 lets you discover and monitor a large variety of different vendors network devices. It monitors any network device that supports SNMP and also provides extended monitoring for devices that implement the Management Information Base (MIB) RFC 2863 and MIB-II RFC 1213 standards. It's this extended monitoring that delivers the deep level discoveries and performance data that you are looking for. 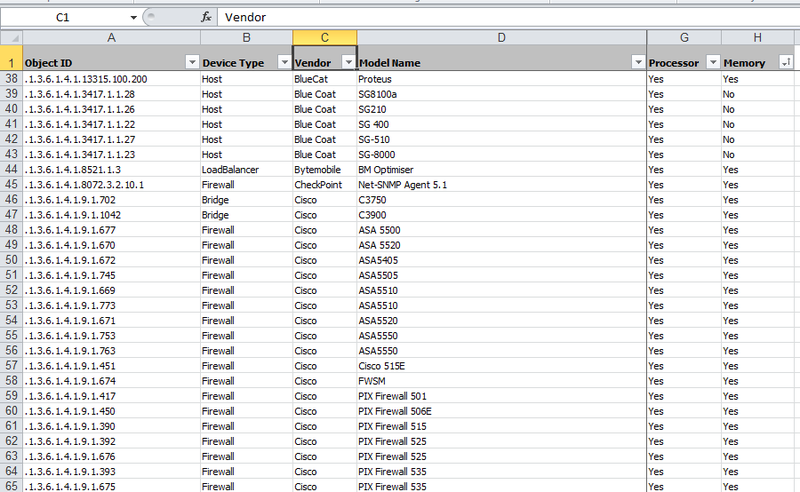 Microsoft have published an Excel spreadsheet with a list of over 800 network devices that support the extended monitoring capability of SCOM 2012. The information in the list is based on OID, device type, vendor, model name, and whether or not the processor and memory are monitored as part of the extended monitoring function. From the spreadsheet (see screenshot below) you can see what level of network monitoring you can expect from your device. The level of information that you are going to see is dependent on the MIB that Microsoft has used in the discovery. If your device is on the list then it will be “Certified” and this means that some level of detailed monitoring will take place that can include information on Processor, Memory and Chassis. If your network device is not on the Excel spreadsheet then it will be discovered in SCOM as a “Generic” network device, and it's this type of basic monitoring that you would have encountered in the first place. 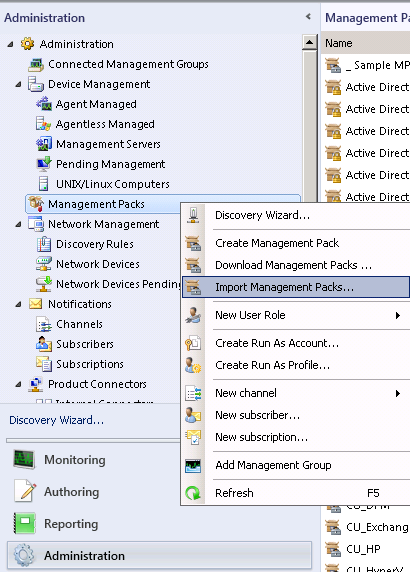 A quick way to see what type of monitoring is available for your already discovered network devices in SCOM is to simply click on the Monitoring tab within the Operations Manager console, then browse to the Network Monitoring folder and click on the Network Devices view. Hopefully this post has now given you an understanding of the different certification types and the associated diagram views they can produce for your network devices. SCOM 2012 Network Monitoring - Explicit or Recursive Discoveries? Since April, I've been responsible for a LOT of SCOM 2012 deployments for our customers and often get asked to explain the difference between these two network discovery options. This post will aim to give you a better insight into each of them and will offer some advice on when to use each one. 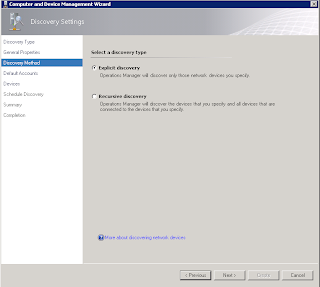 Only one discovery rule can be configured per Management Server. A discovery rule can only perform one or the other of an explicit or recursive discovery and cannot perform a combination of them. 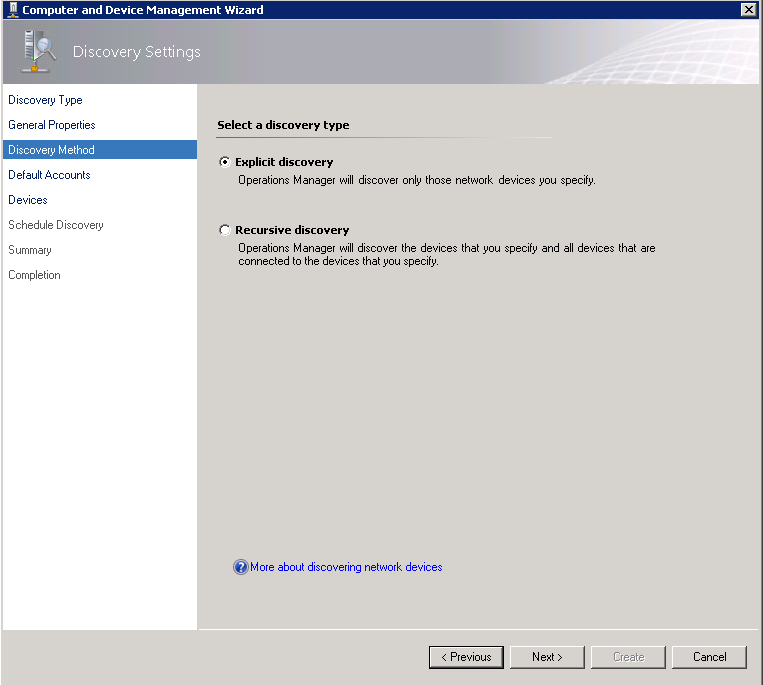 This type of discovery rule is similar to what we had to work with in SCOM 2007 and it only attempts to discover devices that you have explicitly specified in the wizard by their IP address or FQDN. 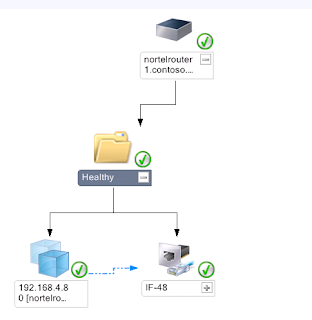 Unlike SCOM 2007 though, if you have a large number of network devices that you want to explicitly add all at once, then instead of having to do them one by one or by network subnet (familiar anyone? ), you now have the option to specify a text (*.txt) file with a list of all the device names or IP addresses that can be imported into SCOM. This is a massive time saver and a welcome addition to the discovery process. This discovery is completely new to SCOM and is a 'party piece' of the EMC Smarts (Ionix) technology that forms the basis for network monitoring in the 2012 release. When you select this discovery option and work through the wizard, you will come to the exact same 'Specify Devices' dialog box (shown in the screenshot below) that you would have encountered when configuring an Explicit discovery and this can initially be a little confusing. 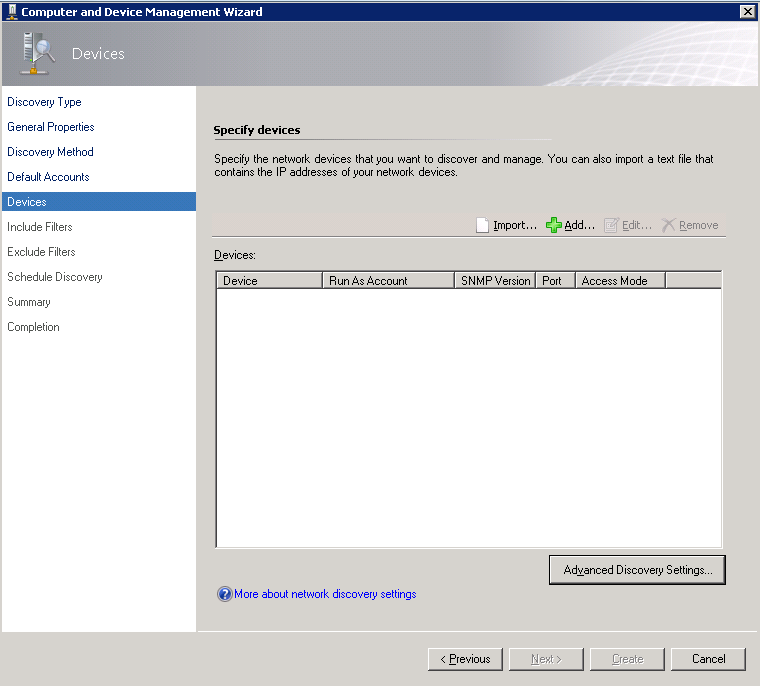 Recursive discovery functions by performing a network scan and attempting to initially discover devices that you have explicitly specified in the above dialog box. Similar to the Explicit discovery rule, Recursive discovery can also be configured to discover and access devices using ICMP, SNMP or both. You could also use an IPv6 addresses however; the initial device that is discovered must use an IPv4 address.That's where the comparison with Explicit discovery ends though. You can also filter out devices that you don't want to be discovered by using properties such as the device type, name, and object identifier (OID). 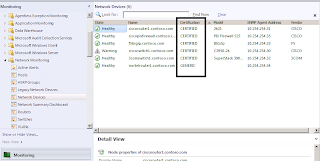 This is a handy option if you wanted to quickly discover all the network devices in your network except, a small number or some with a specific criteria. In really large networks with a lot of network devices, keep in mind that there is a default limit of 1500 network devices that can be discovered recursively. You can of course tweak this limit to suit your environment if you wish, but for most people, this won't be needed. Great, but which is the best discovery rule to use? This is a tough question as every network environment is different and there's no right or wrong answer here. I find that using the Explicit discovery option is the easiest way to control what gets monitored while carrying out new SCOM deployments. It's most likely that you will already know all of the network devices that you will want to have discovered if it's your own network, or if you're out on a customer site deploying SCOM, then the customer will have handed you a list of network devices to start monitoring. This method is useful also for controlling alerts and ensuring that your tuning and noise reduction process is confined to a certain number of network devices initally. 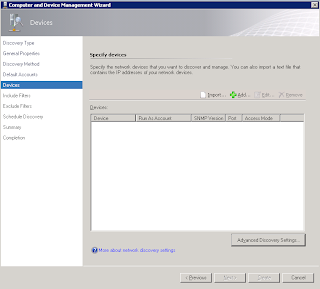 You need to have a list of all of the network devices that you want to monitor with SCOM 2012 and this can be cumbersome trying to put together or a lot of the time, if you arrive onsite with a customer to configure this, they might not have an up-to-date list of their devices and there's always a chance that you've missed something important. The Recursive discovery is definitely the 'sexier' of the two rules and you'll get a buzz from seeing all of the network devices getting discovered automatically in a relatively short space of time with very little input from you required. If you don't have a list of all the network devices on your network, then use this option to probe the ARP cache and discover everything for you. You can also create a schedule to run your recursive discovery rule a number of times a day/week/month etc. and for this reason it's very useful if you have a high turnover of network devices spread across your environment. The downside to Recursive discovery scheduling though is that, it can put unnecessary load on your management servers in large network environments by discovering devices that ordinarily you have no requirement to monitor and manage. It's also not recommended to run this more than twice a week in large environments that don't have a high turnover of network devices.